WARNING! This is a LOOOOONG post filled with lots of pictures!! Today I’d like to talk about decorating your space without breaking your bank account! Believe it or not, it CAN be done!!! 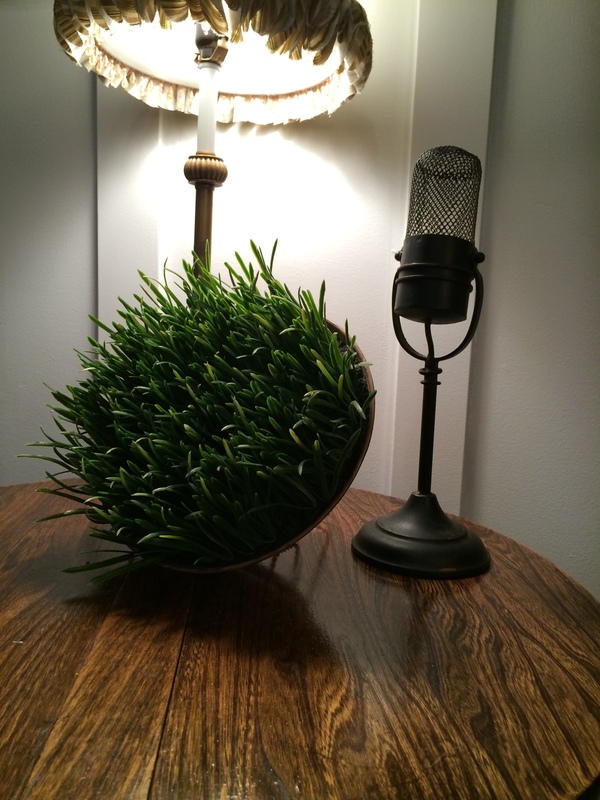 First of all, look around your home….USE WHAT YOU HAVE! 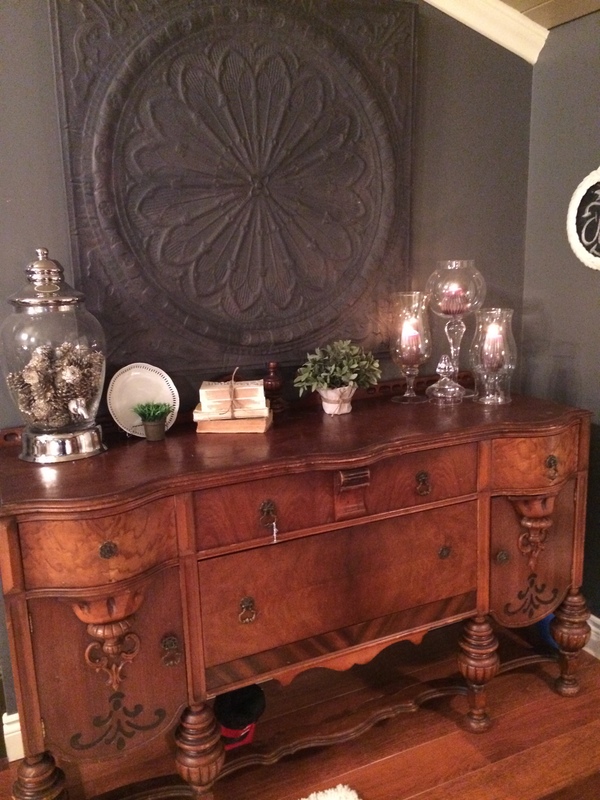 Chances are you have some really great stuff just waiting to be displayed or re purposed in a new way. For example, I found these really cute little plates in a second hand store for $.50, they caught my eye because they were white and had sort of a “lacy” edge. 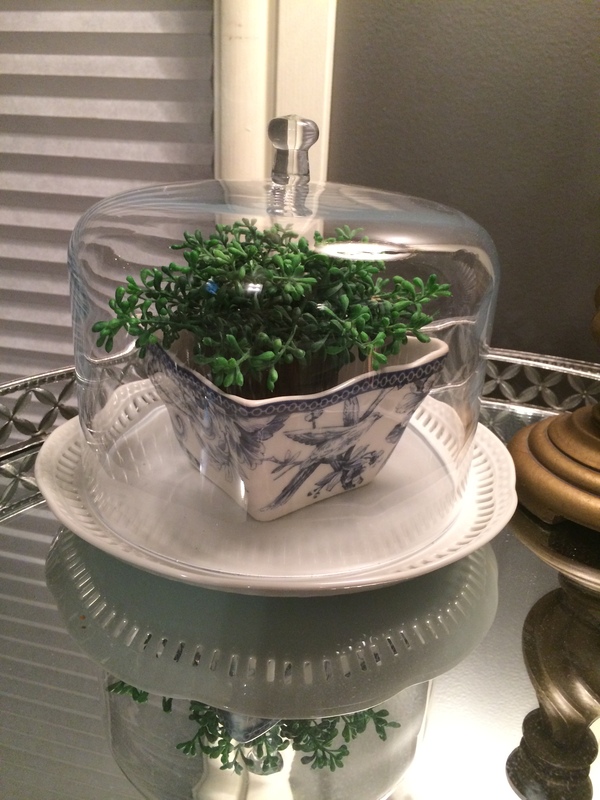 I had no idea when I bought them that I could use one to make a cloche with a plant inside. I had broken a small cake stand one time but salvaged the glass dome from it, placed it on the plate and it fits perfect. 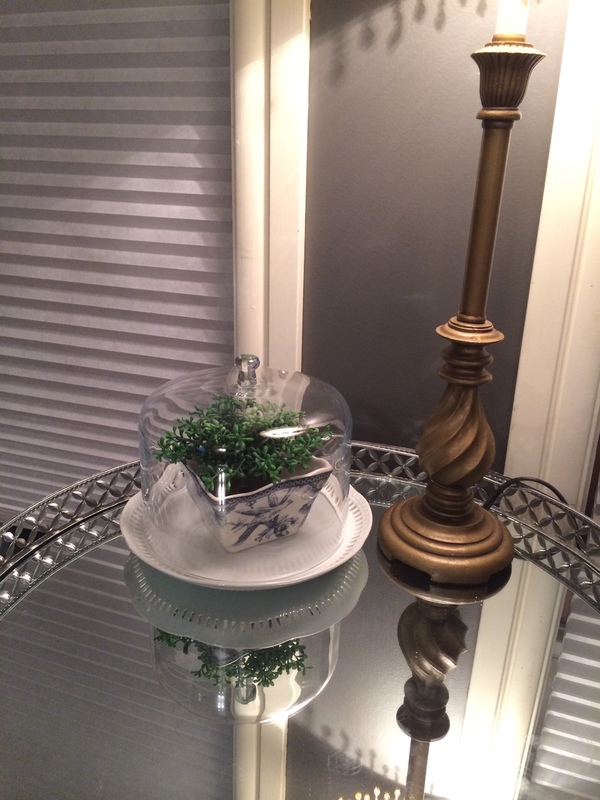 Throw a small plant in a decorative bowl inside and you have a lovely little cloche vignette for a side table. 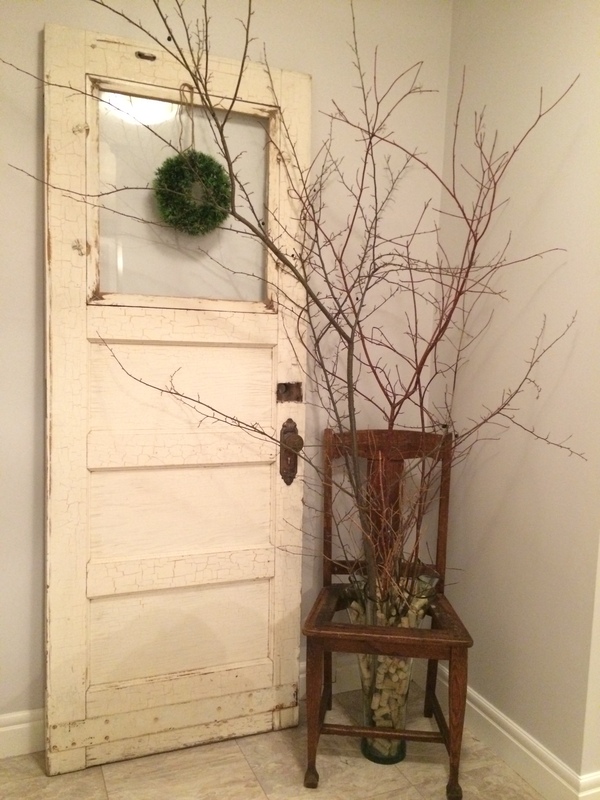 Sometimes we have things around the house specifically bought for one room. Try taking furniture from one room and use it in another. 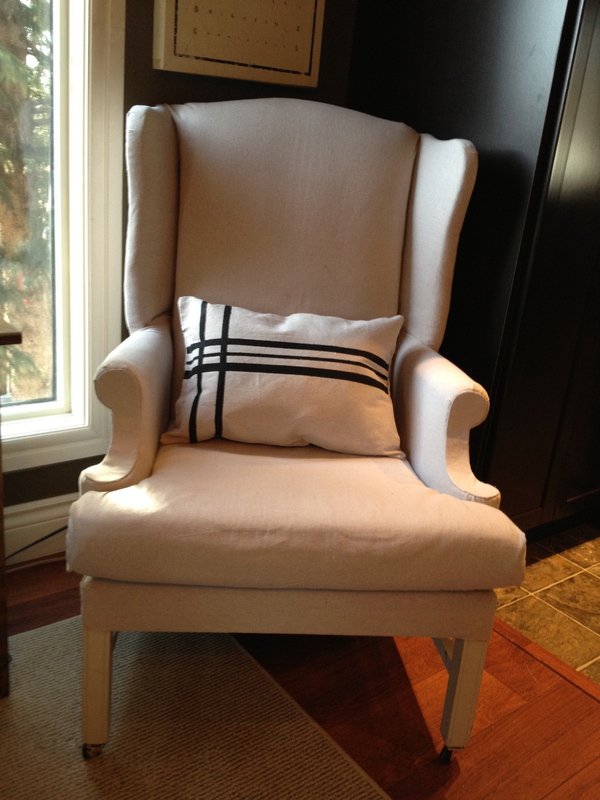 I had a wing back chair that had lived in almost every room in our house. 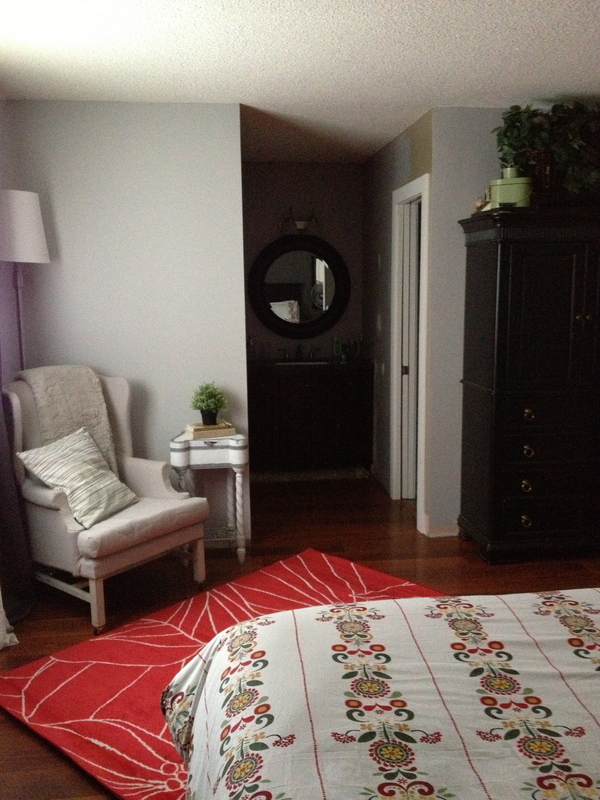 It went from the family room to the living room, even to the dining room before ending up in our master bedroom. 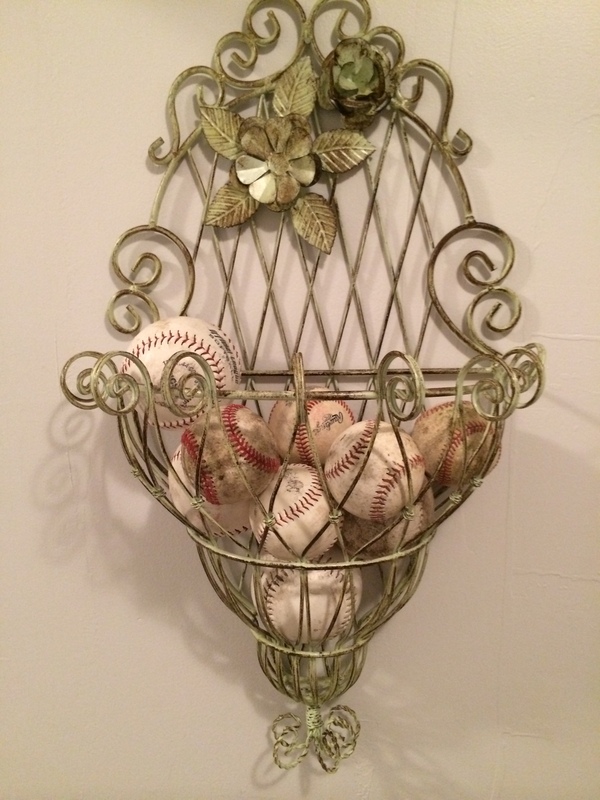 Sometimes when you move things around, and not just furniture but ornaments too, it makes things feel new again. Sort of a freshening of sorts. 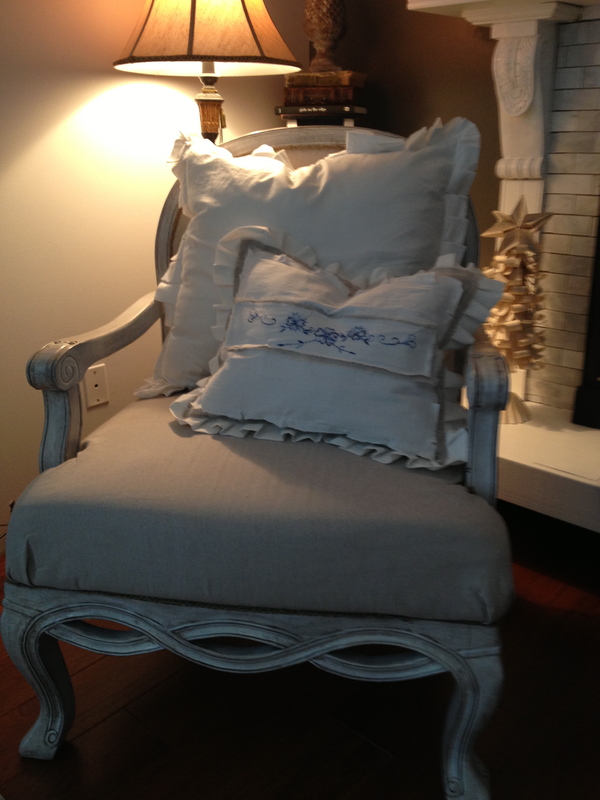 Create a small reading nook or study area in a corner of one end of the room. 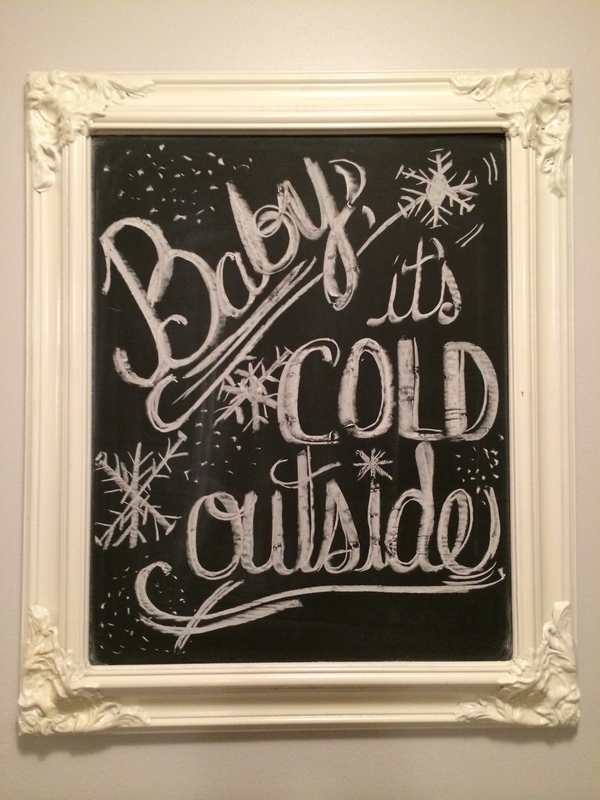 I did this in one of our family rooms. 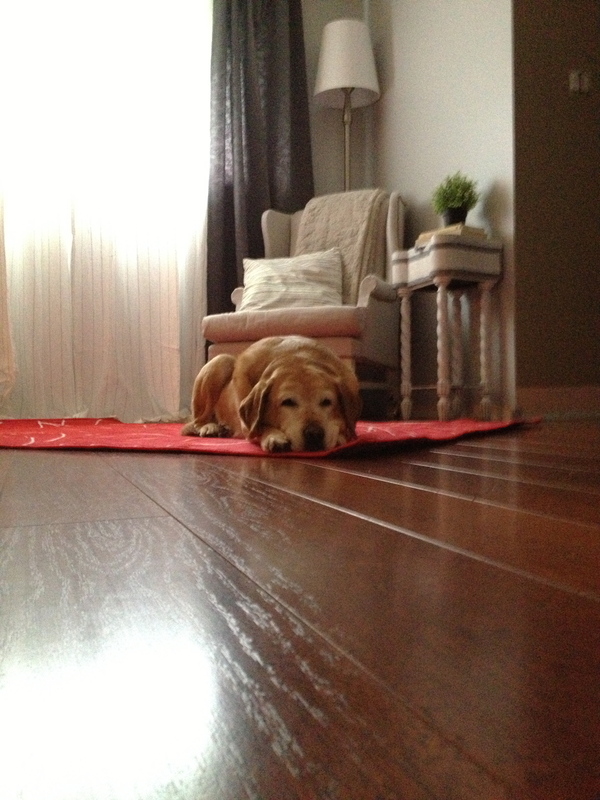 I laid out a small area rug in one end of the room and placed a primitive table I had on it. 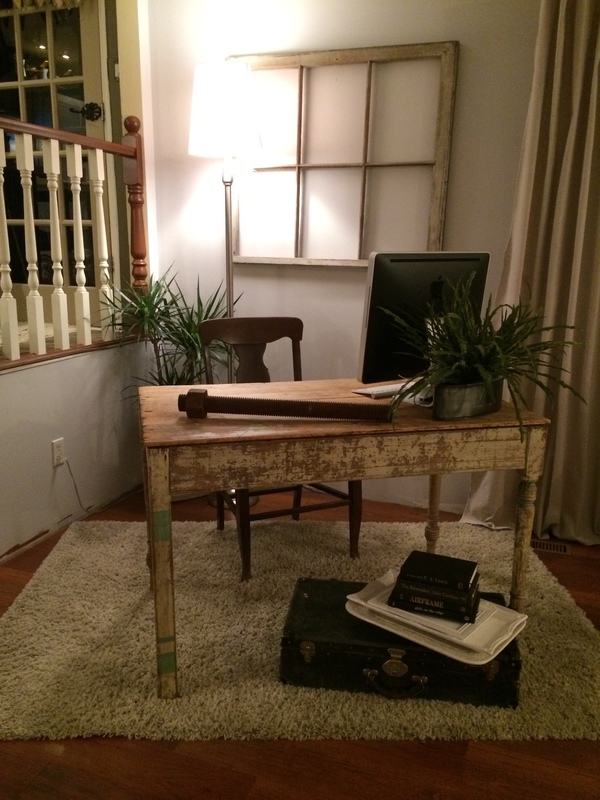 It was just the right size to use as a computer desk and for the rug, added a chair and our computer and …tada!… we had a small office type area. By using the throw rug, it divided the room and designated a bit of a study area…it gave definition to the function of the space. 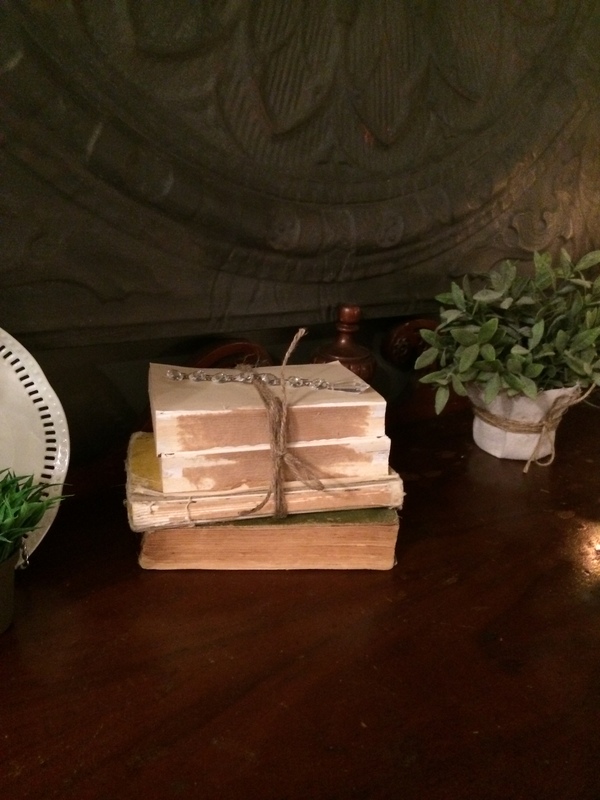 It also helped with the challenge of decorating a long rectangular space. 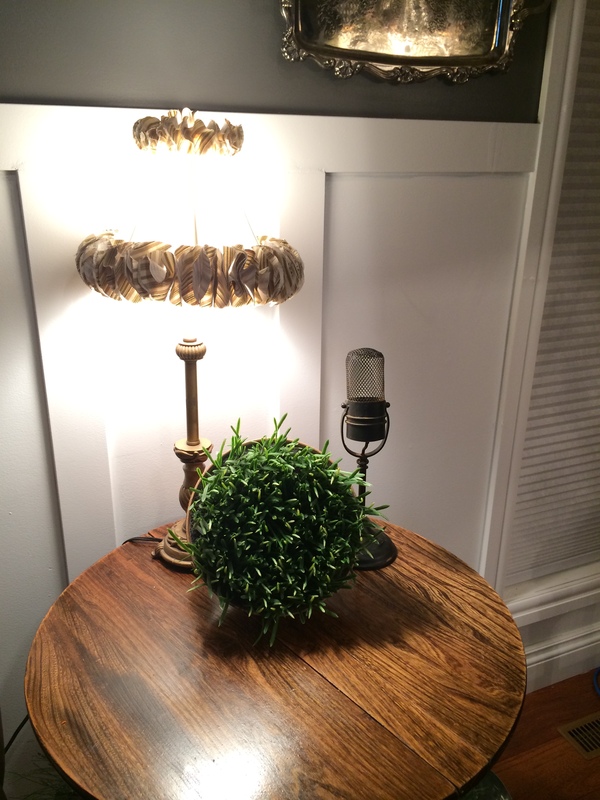 You can create small vignettes everywhere using things you have around the house. 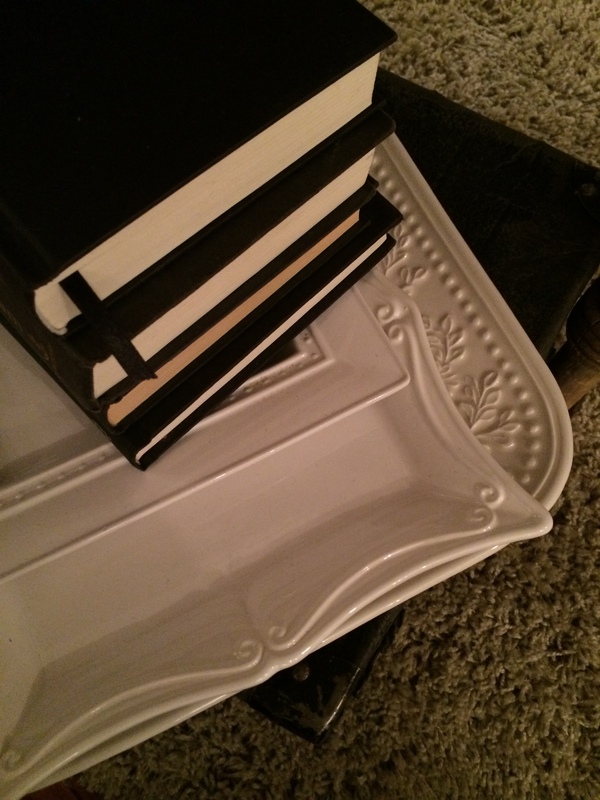 I used some books stacked up on some white serving platters I have, then placed them on an antique suitcase I use to store extra school supplies for the kids…layering items can also be quite pretty. This way I get to see my pretty platters all year round and not just on a special occasion. When I go out some where I am always on the look out for interesting pieces or things with visual interest. I don’t buy things “just because” or just because it might be a good deal. 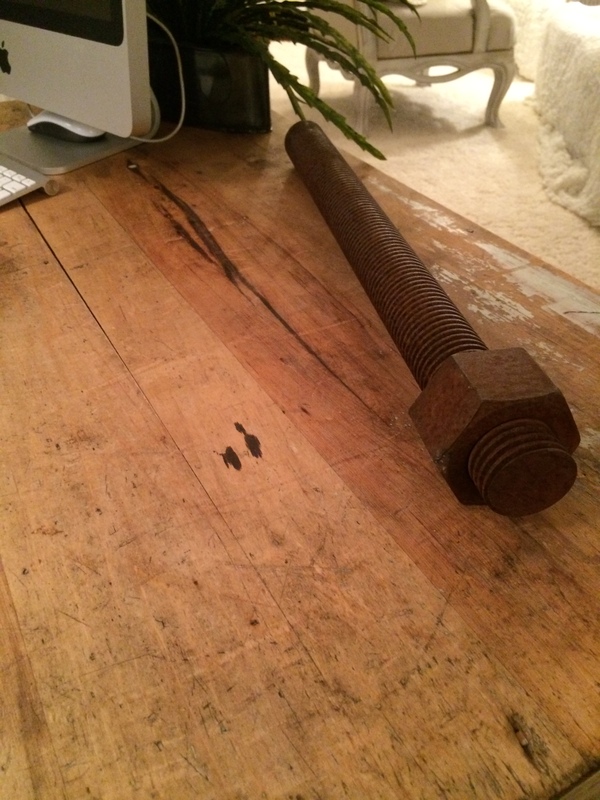 It has to have a purpose in my home, a place to be before it ever gets there… For example…this is a shoring bolt…I love how huge and rusty it is….Definite visual interest! 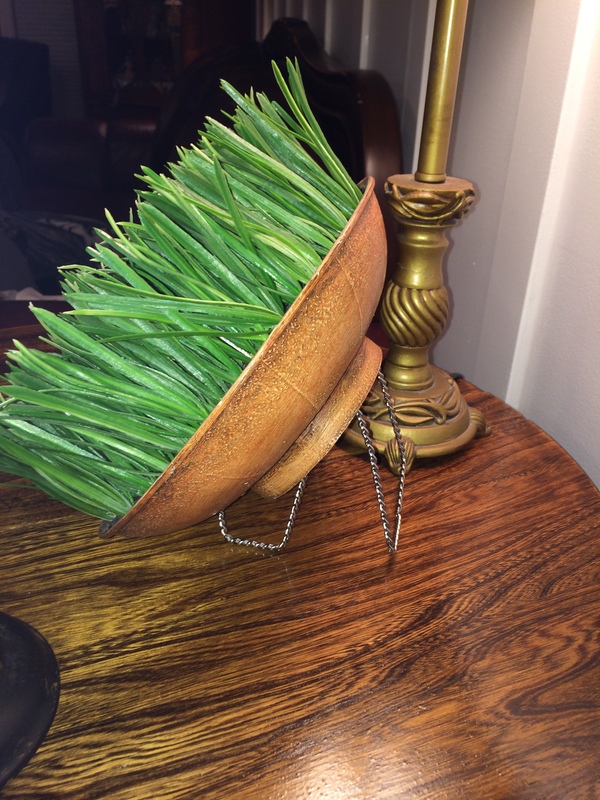 I display it on my primitive table…it didn’t cost me a dime…just “found” it…liked it and brought it home to use as an ornament, not at all what it was created for…this is thinking outside the box. I love how it looks on my desk! 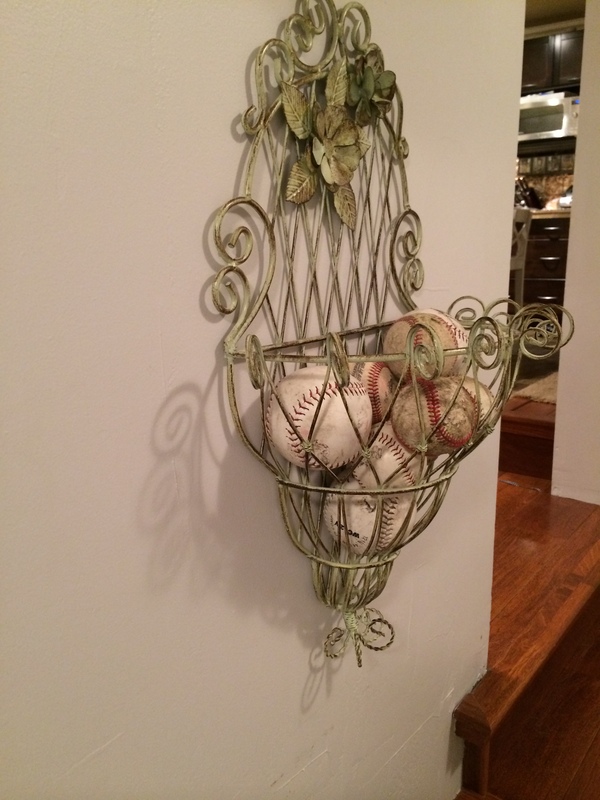 Another example of using an item for something other than what it was intended for is this decorative antique looking wire wall planter (bought at a garage sale for $2.00) …I use it to hold the kid’s soft balls and baseballs at the front door…easy to get at for the kids and easy to put away when done, and it looks kinda nice too! 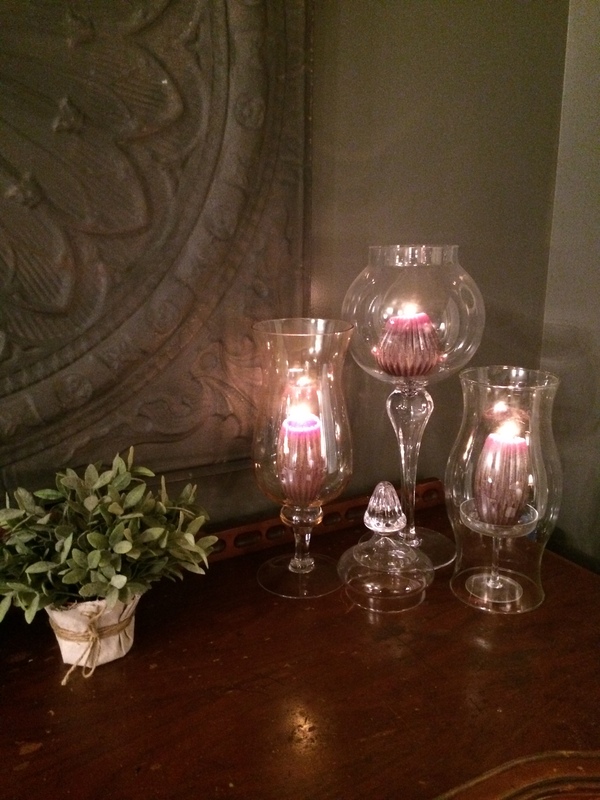 I use pieces from my glass collection to hold some pretty candles…Thank you Barb! 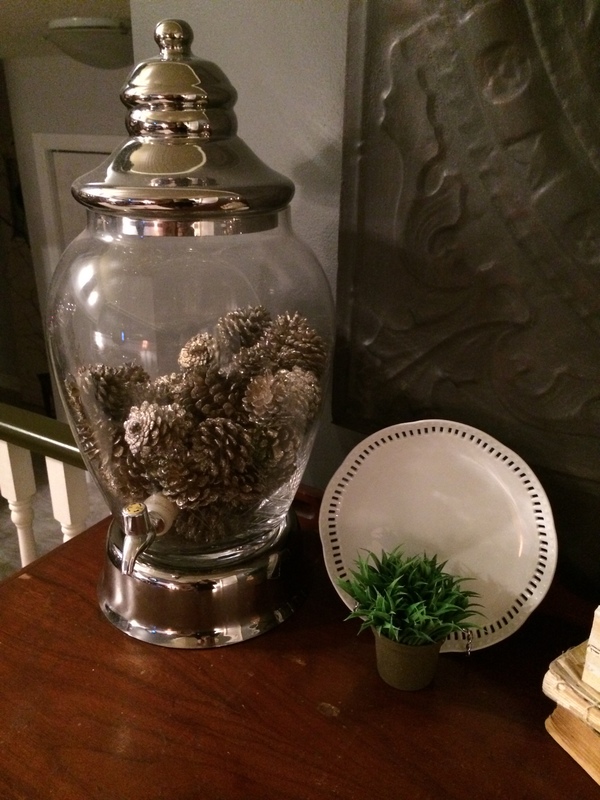 I filled a lemonade dispenser I have with pine cones…. I have a matching one in the kitchen that holds our bulk quick oats and another in the laundry room that dispenses liquid laundry soap!….pretty and functional! Of course, things take time to collect and little by little we accumulate things. 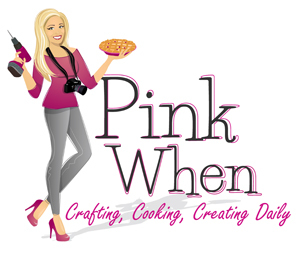 If you are like me I get tired of my things over the years, but I don’t have the budget to buy new all the time… that’s when I get creative with what I have and try to see it in a different way and make it work. 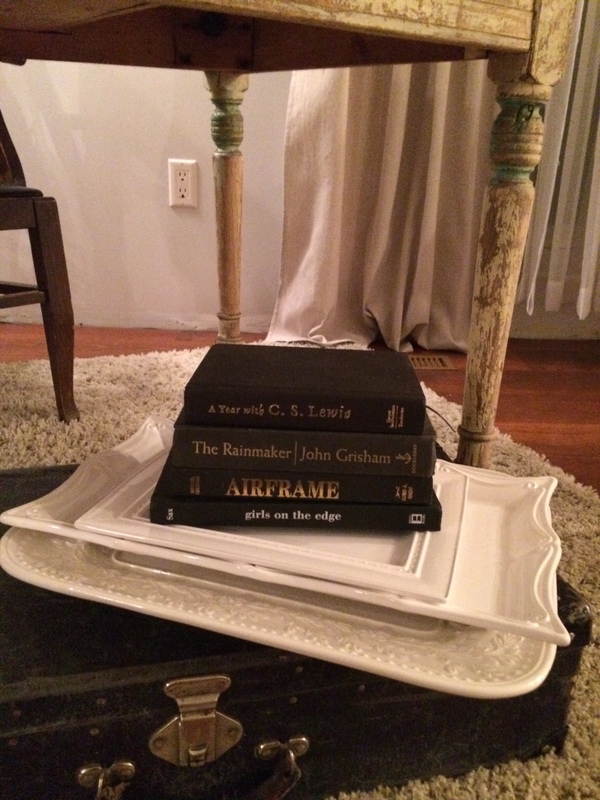 Take something meant to sit flat and put it on a stand…. I think that if we can repurpose things and move them around the home then we don’t actually need to go out and buy new things. Even giving something a fresh coat of paint can really change a piece, therefore taking away the need to replace it with something new. 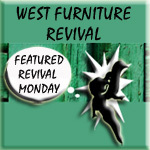 Paint (or even fabric) is cheaper than buying new furniture or accessories. 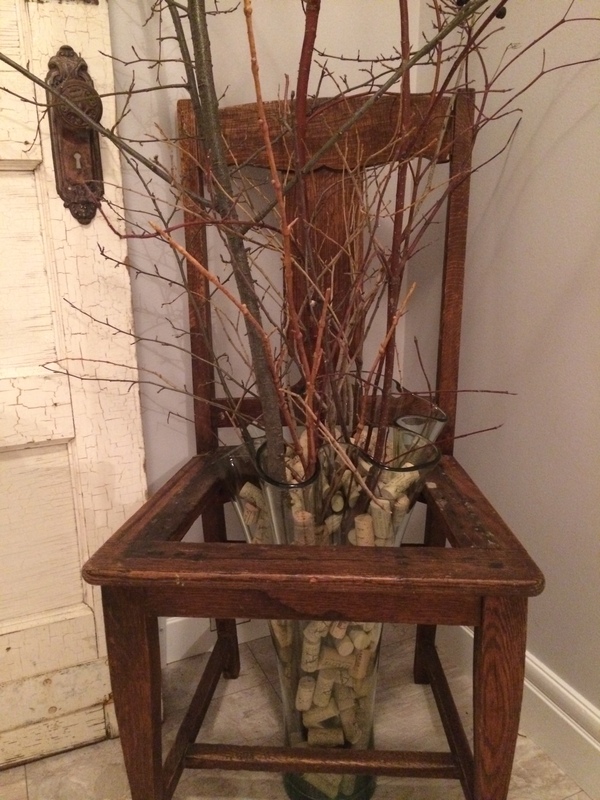 Hope this has inspired you to see and use what you already have in a new way…. Great ideas! 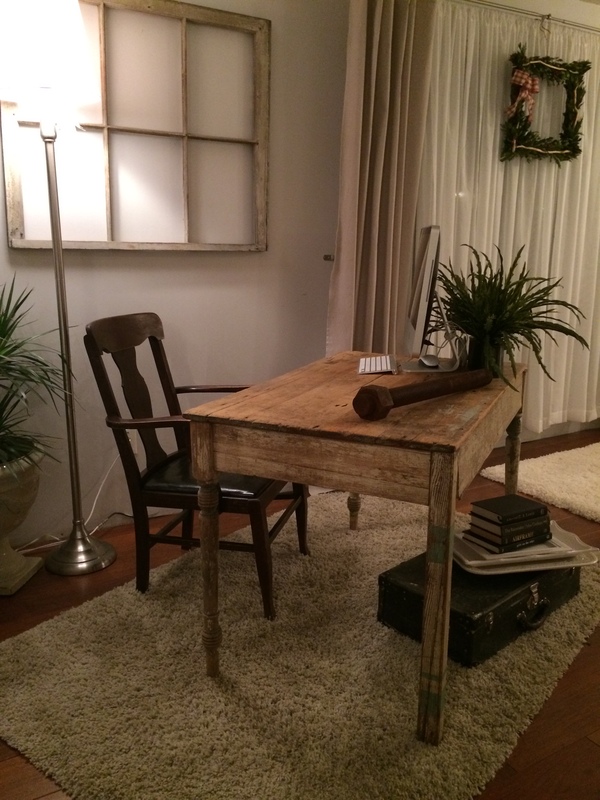 Love that giant bolt on your desk…great texture!